There is no place like Metro Vancouver when it comes to the ice cream scene. With new shops popping up across the region, you won’t have to look far to get a cold, sweet treat on a hot summer’s day! High-end ice cream has become a staple in our culinary realm, with shops like Earnest and Rain or Shine setting the bar high. Whether you’re looking for good old-fashioned ice cream or curious to try something new, The Buzzer blog’s got you covered with 9 epic transit-friendly ice cream shops! Hours: 1 p.m. – 10 p.m. This cozy, family-run shop specializes in liquid-nitrogen ice cream, made in-house and to-order! Offering a variety of tasty flavours (vegan included), you can enjoy your ice cream in many forms. Their ice cream sandwiches are on point! We’d recommend Le Norm. For something really different, try a house-made Kombucha float! You can always grab a ready-to-go pint or order an ice cream pie with your choice of a waffle, Oreo or vegan and gluten-free date and nut crust. 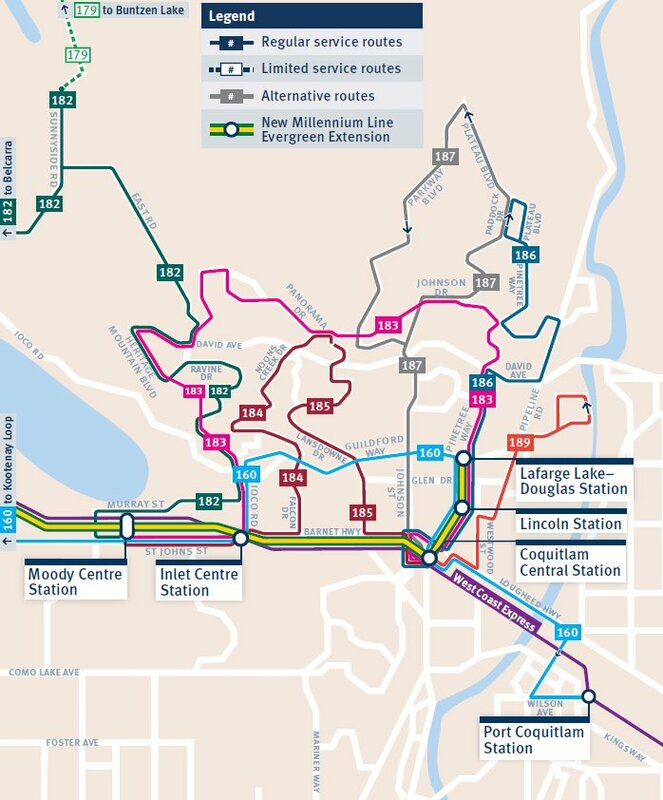 This round of Bus Route Buzz is dedicated to the Central Tri-Cities including the 97 B-Line. Wave goodbye to the 97 B-Line and hello to Evergreen! 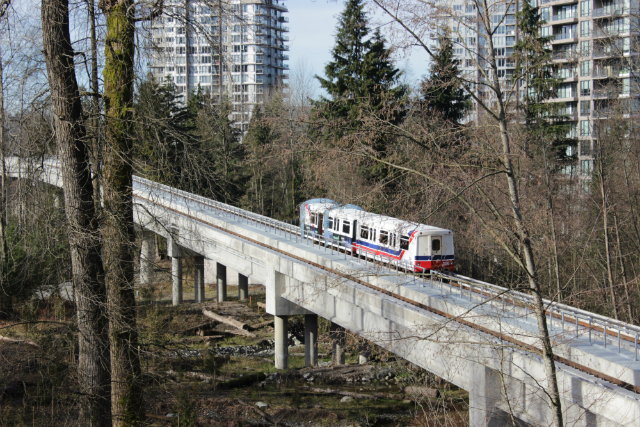 The B-line will be discontinued as of December 19 and riders will now have a rapid transit option with SkyTrain on the Evergreen Extension. This is much like what happened in Vancouver with the introduction of the Canada Line. Travelling to school at Port Moody Secondary? The school will continue to be serviced by the 180 (formerly C24) and the 160 route. We are also increasing the capacity of these routes during peak periods to help accommodate student demand. This means frequency will increase to 15 minutes and the route will now have full size conventional buses. This route is getting a new name! 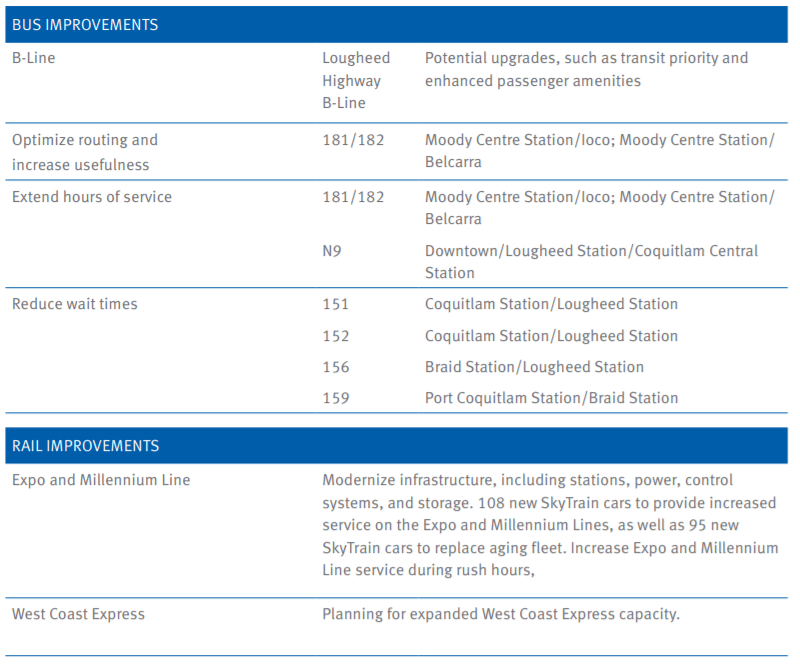 The C24 will now be the 180 Moody Centre Station/Lougheed Station and operate with a larger 40-foot conventional bus plus receive 15 minute frequency during peak periods. The 180 will provide local service on North Road and St. John’s Street, via the College Park neighbourhood as the 160 continues to provide service on St. John’s Road, Ioco Road and Newport Village. 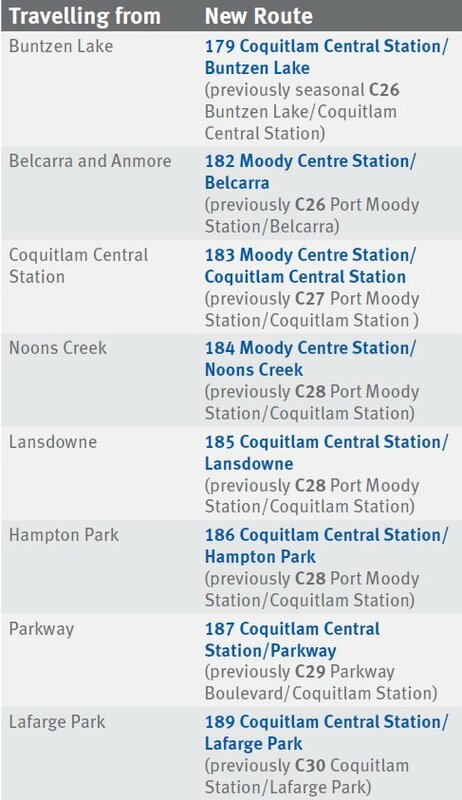 For local bus stops not serve by SkyTrain, take the 160 or 180. 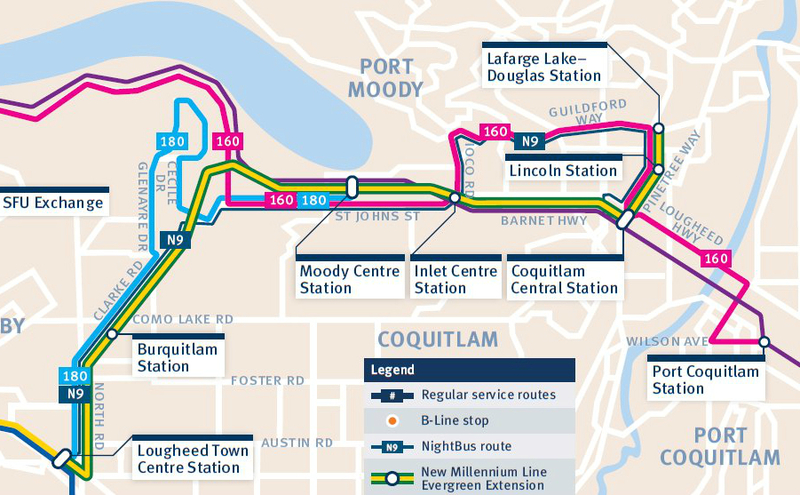 Extended late night service on the N9 between Lougheed and Coquitlam Central Stations creates 24-hou service along the Millennium Line corridor. 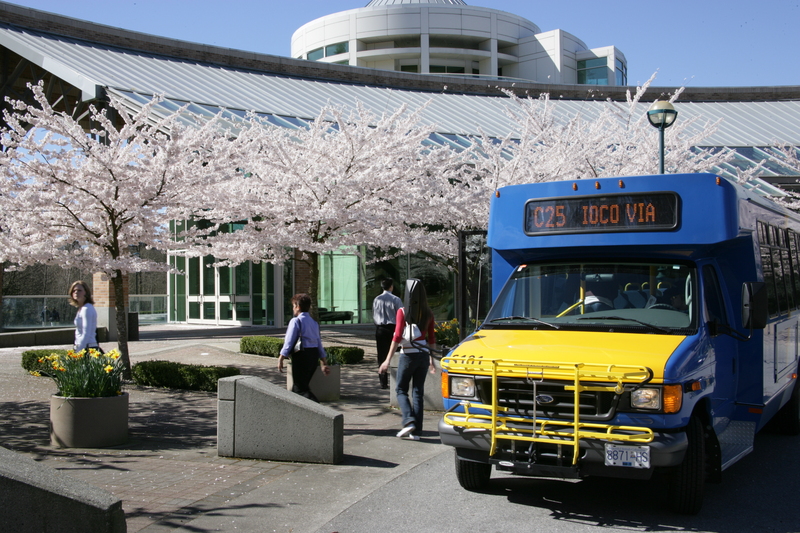 Stay tuned for the next edition in our bus route where we look at some routes in Southwest Coquitlam.